Liverpool took advantage of Manchester City being in FA Cup action to return to the top of the Premier League with a nervy win at Fulham. 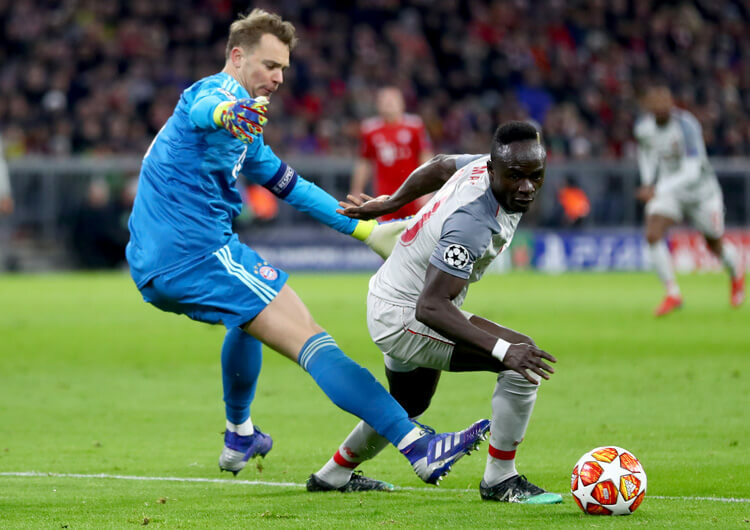 Jurgen Klopp’s men looked in cruise control when Sadio Mane slotted home a Roberto Firmino cutback to fire the visitors ahead midway through the first half. The Reds had chances to extend their lead, but a second goal proved elusive and their wastefulness looked like being punished when Ryan Babel took advantage of a horrendous mix-up between Virgil van Dijk and Alisson to equalise with 15 minutes left. Fortune was on Liverpool’s side, however, as Fulham goalkeeper Sergio Rico fumbled a Mo Salah shot and then pulled Mane back in the home penalty area. Substitute James Milner stepped up to score from the penalty spot, and earn the win that sees Liverpool go two points clear of City at the top, albeit having played a game more. Fulham, 13 points from safety, look doomed. Caretaker manager Scott Parker set Fulham set up in a 4-3-3 formation, with Andre-Frank Anguissa, Tom Cairney and Jean Michael Seri forming a midfield trio behind Ryan Babel, Floyd Ayite and Aleksandar Mitrovic. The hosts had two main strategies in attack: play direct, or exploit the wide areas. When Fulham played direct, they tended to look to Mitrovic to hold the ball up and bring others into play. The big Serbian had a difficult time against Joel Matip and Virgil van Dijk, however, as the strategy proved largely ineffective. When the Cottagers looked to build wide, they tried to rotate their outside central midfielders and wide attackers.  Floyd Ayite or Ryan Babel would drop towards the ball as their full-back or central defender had possession, while Tom Cairney or Jean Michael Seri would advance. The player in possession would then look to play to the feet of either Cairney or Seri, who would receive with back to goal and set to the forward-facing Babel or Ayite – in this way, Fulham could break the line of pressure and continue the attack from a more advanced area. 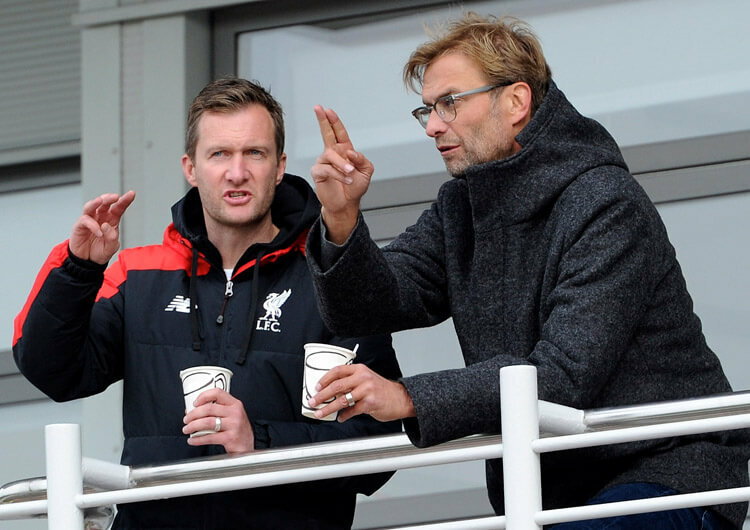 That said, the hosts lacked both the speed and quality to cause Liverpool real problems from these situations. 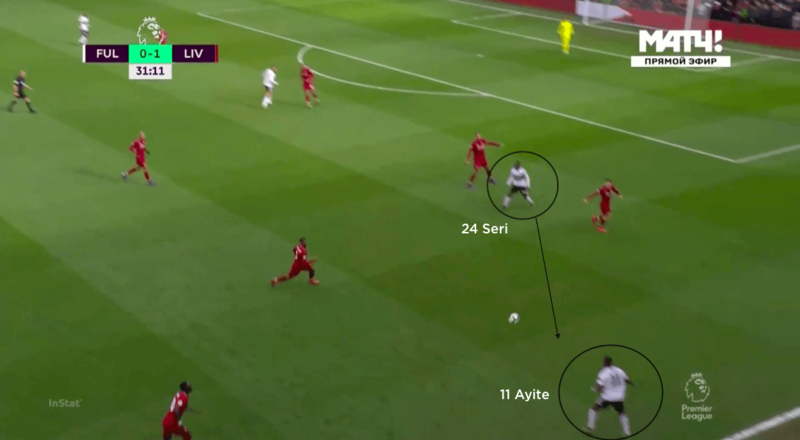 Returning to their direct approach yielded little more success, as Mitrovic often lacked support – particularly from wide, where Babel and Ayite had to consistently track back to cover the relentless forward movements of full-backs Trent Alexander-Arnold and Andy Robertson. Parker tried to resolve this by introducing Ryan Sessegnon and Cyrus Christie as wing-backs to take on the responsibility of tracking Liverpool’s full-backs, thus allowing Babel to join Mitrovic on the top line. This paid off within minutes, when Babel was in a prime central position to capitalise on a mix-up between Alisson and van Dijk to score Fulham’s equaliser. Out of possession, Fulham operated in a 4-1-4-1 shape. Ayite and Babel tucked in to join Cairney and Seri in the midfield line of four, while Anguissa remained between the defensive and midfield lines and Mitrovic led from the front. 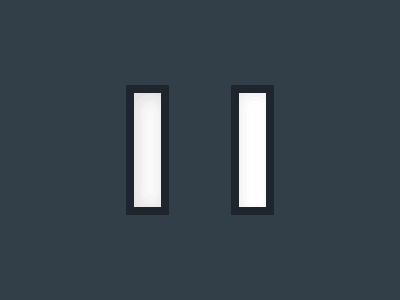 The hosts switched between a mid-block and a high press. 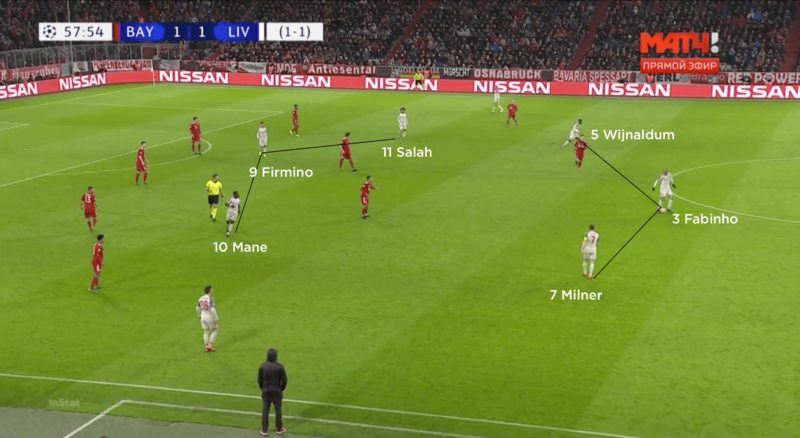 During the mid-block phases, they would try to deny Liverpool any opportunities to penetrate centrally by maintaining strict horizontal compactness and forfeiting the wide areas. Their trigger to press from the front was based on Mitrovic’s access to the man in possession. 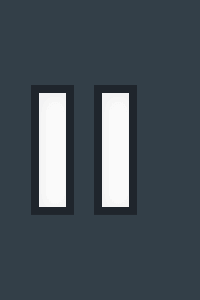 If the forward decided to press one centre-back, then one of Cairney or Seri would push off from Fabinho and join him on the top line to press the second centre-back. The other central midfielder would then jump on to Fabinho, while Anguissa affected either Georginio Wijnaldum or Adam Lallana, and the wide attacker on that side pushed on to the Liverpool full-back. There were definite signs of improvement from Fulham in defence, but Sergio Rico’s clumsy late challenge on Sadio Mane led to the penalty that cost the hosts a point and secured them an unwanted Premier League record of 11 straight games conceding at least two goals. Fulham set up in a 4-3-3 formation in possession, with Ryan Babel and Floyd Ayite supporting central striker Aleksandar Mitrovic from out wide. The hosts dropped into a 4-1-4-1 shape out of possession. 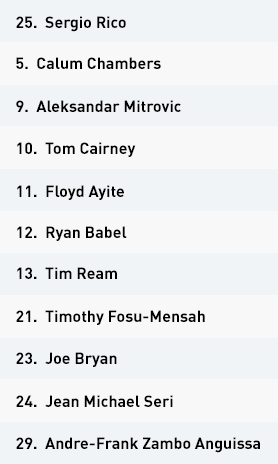 Babel and Ayite tucked in alongside central midfielders Tom Cairney and Jean Michael Seri, with Andre-Frank Anguissa sitting between the lines. 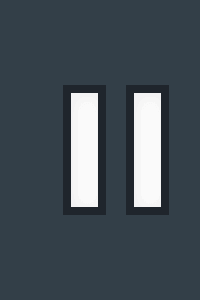 The Cottagers shifted between a mid-block and high press. 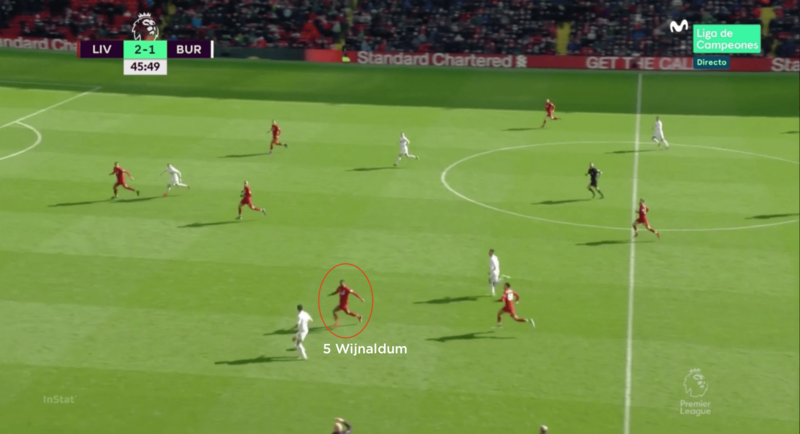 The trigger for the latter was when Mitrovic pushed up to press a Liverpool centre-back in possession – one of the central midfielders would then join him on the top line to affect the other. Scott Parker’s men looked to use rotation in wide areas. Here, Seri moves higher on the right to receive with his back to goal and set back for his wide attacker, Ayite, to get on the ball facing forward. 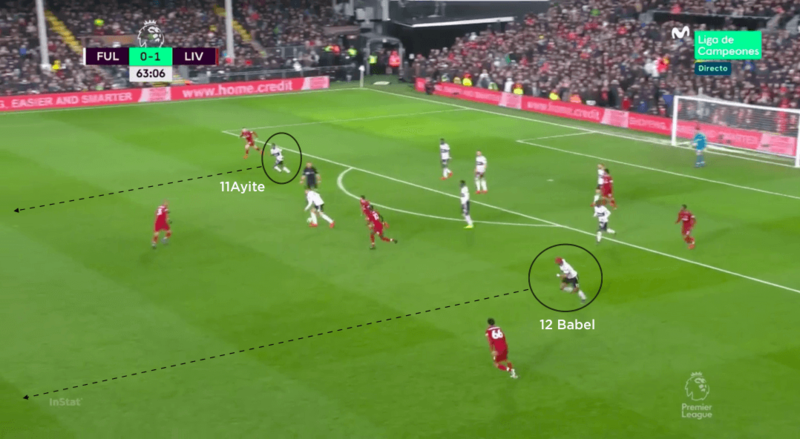 Fulham struggled in transition, with Ayite and Babel often having too much ground to make up after tracking the Liverpool full-backs all the way back to their own area. Liverpool set up in a 4-3-3 formation in possession. 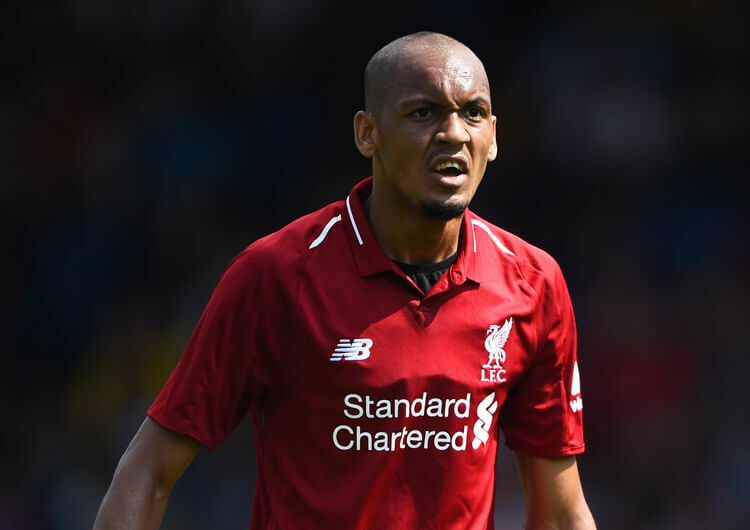 Fabinho sat as the lone pivot alongside Georginio Wijnaldum and Adam Lallana, behind the usual front three of Mo Salah, Sadio Mane and Roberto Firmino. 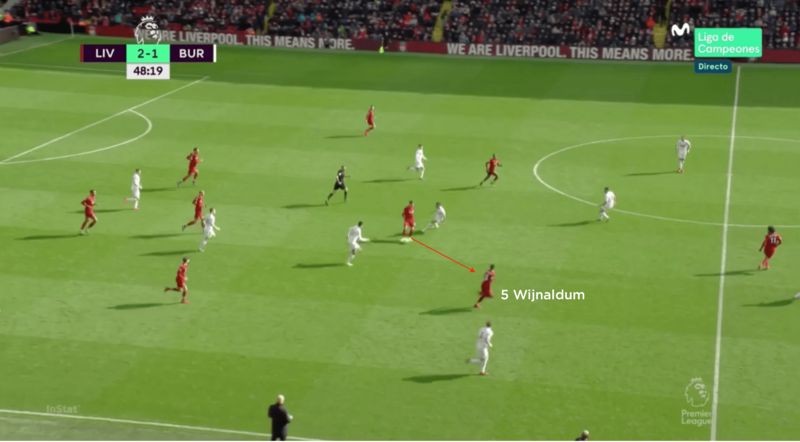 The Reds operated in the same 4-3-3 shape off the ball, but didn’t really press with any great urgency until the ball was played forward from the Fulham back four. The visitors looked to build in wide areas, playing short diagonal passes in behind for diagonal runs from central runners. This is how they eventually opened the scoring, with the above run from Firmino leading to the cutback from which Mane fired home. 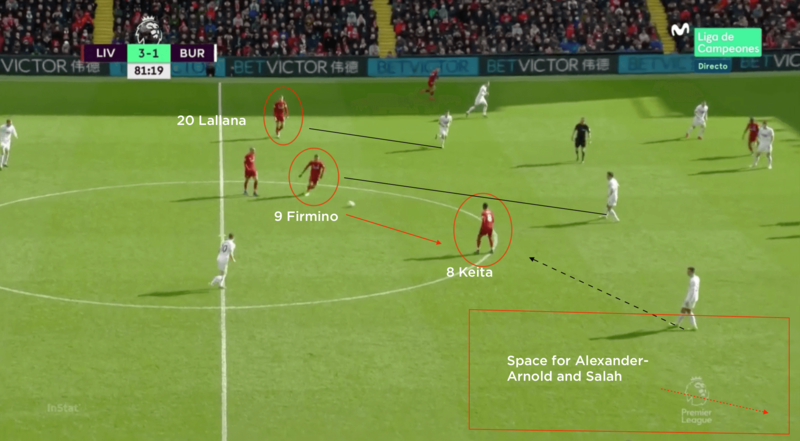 When they built centrally, Firmino would drop deep to form an overload in midfield; Lallana would then look to get in on the blindside of his man and receive in the space Firmino had vacated. 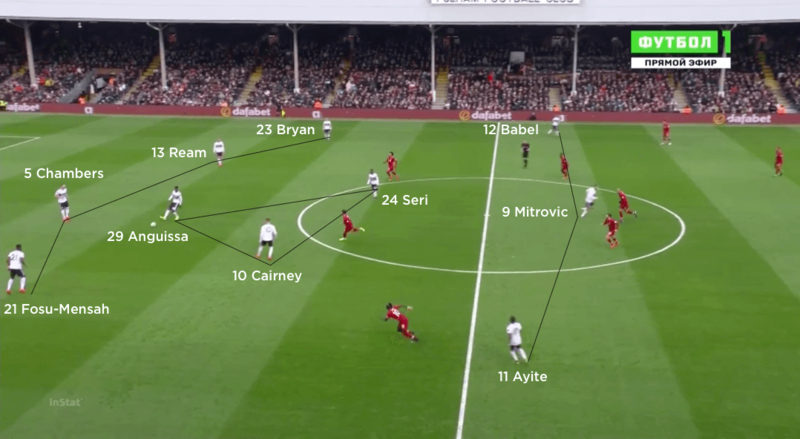 Fulham’s compactness in central areas opened up the possibility of long switches to the wide areas, where both Liverpool full-backs maintained full width throughout. This was particularly the case on the right, where Trent Alexander-Arnold enjoyed vast open spaces for much of the game. Jurgen Klopp set his Liverpool team up in a 4-3-3 formation, with Fabinho, Georginio Wijnaldum and Adam Lallana as the midfield three behind the usual front trio of Mo Salah, Roberto Firmino and Sadio Mane. In the early stages of the game, Liverpool looked to send Salah and Mane in behind with long passes from deep, but these were often overhit and easily dealt with. As they looked to try and build centrally, they would use rotation between Firmino and Lallana to move the ball into advanced areas. 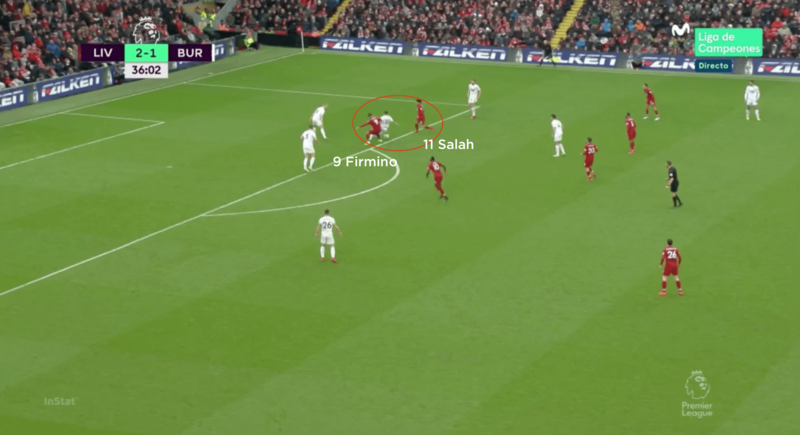 Firmino would drop towards the ball to create a central four-on-three overload; as he moved deeper, Lallana looked to move on the blindside of his direct opponent into a more advanced area. The ball could then arrive at Firmino’s feet, from where he could advance play on to Lallana further up the pitch. 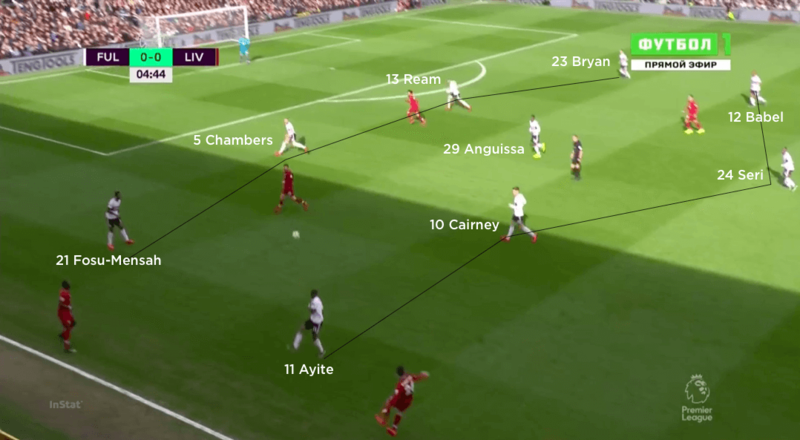 As the game progressed, the key for Liverpool in possession was how they tried to exploit the wide areas and, most importantly, use their full-backs. 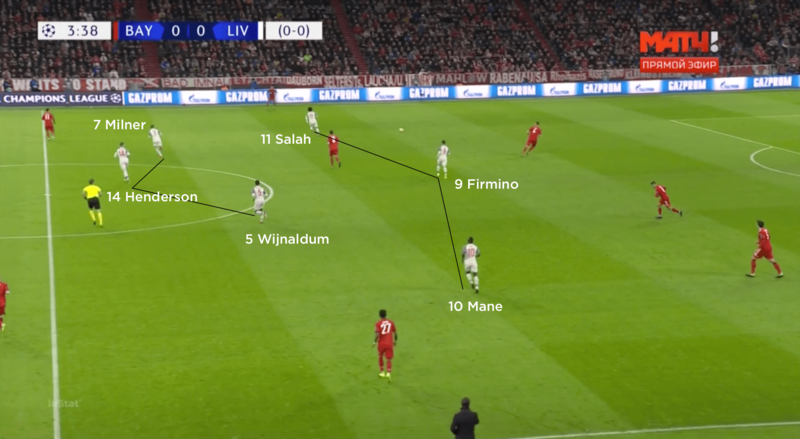 They looked to exploit the space behind Fulham’s full-backs, and would use Andy Robertson and Trent Alexander-Arnold, or occasionally Salah and Mane, to receive out wide and play short diagonal passes in behind for the diagonal runs of attackers from central areas. It was from one such Firmino run that the Brazilian cut back for Mane to score the opening goal. Liverpool also used Robertson and Alexander-Arnold to overlap. With Fulham extremely compact, the visitors identified the importance of switching the point of the attack through long, diagonal passes from one side to the other. With that in mind, Robertson and particularly Alexander-Arnold would often stay wide when play was building on the far side. As Fulham shuffled across to remain compact, this then opened up space for the big switch. Out of possession, the Reds operated in their 4-3-3 structure and moved between a mid-block and a more aggressive press. Liverpool had the majority of the ball, and therefore didn’t spend a significant amount of time in their out-of-possession phases. 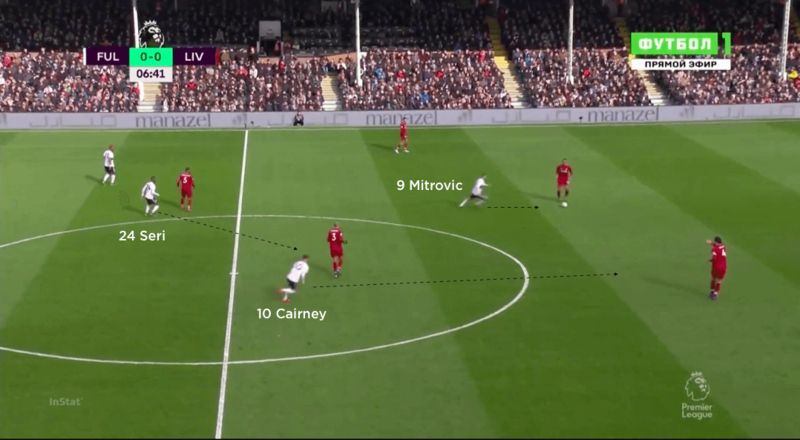 When they did, Mane and Salah would generally try to show Fulham inside in order to limit their opportunities to get the ball wide and cross for Aleksandar Mitrovic. The press wasn’t hugely intense until the ball was played forward from the back four, at which point Liverpool would apply much more aggressive pressure. In order to achieve this, the midfield three and back four had to be on the front foot and ready to step in as soon as the ball began travelling forwards. 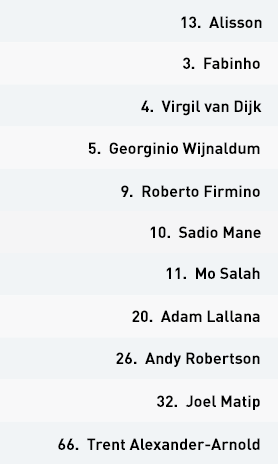 Robertson and Virgil van Dijk, who showed he was human after all in the mix-up that led to Ryan Babel’s equaliser, were particularly impressive in this area.